The PS3 controller, original Six-axis or DualShock3, uses bluetooth technology to connect to the Playstation3. This technology allows for great range, around 25'-30', and more importantly the signal is not broken due to a line of site interruption. The problem does arise occasionally when the the PS3 controller will no longer sync with the console. When the PS button on the controller is pressed the four lights on the front of the controller will blink for a couple of seconds and then the controller will connect to the console with this being indicated by one of the lights turning solid. If, when the PS button is pressed, the four lights continue to blink, this indicates that no bluetooth connection is being established. Console is not plugged in and/or in standby mode, or console has been unplugged or had a hard reset recently. Simply make sure your system is turned on and poceed to syncing your controller. Controller is new and has not been synced to the console or the battery pack within the controller is completely dead. (No lights will blink when PS button is pressed if battery is dead.) Turn your system on and connect your controller via the USB cable and let the controller charge. You may proceed to syncing the controller to use while it is charging, but do not unplug the controller to use via bluetooth until it is fully charged. Controller lost its bluetooth settings and needs to be reset. If controller will not stay synced in bluetooth mode(wireless), proceed to section on resetting the controller. Bluetooth failure within the PS3 console. This will be indicated by not being able to connect any Bluetooth devices to the console. This would include bluetooth headsets, controllers, etc. 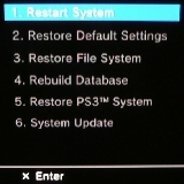 SEMPERTHREE recommends that you send your system in to Sony for repair. You could also see our section on non-authorized Sony PS3 repair. With the console turned off, turn your controller upside down so you are looking at the back of the controller with the triggers facing away from you. On the right side of the controller, you will see a very small hole, this is a reset button. Take a small pointed instrument, such as a toothpick, end of a paper clip or very small ball point pen and insert it into this hole and press the reset button and hold it down for about 5 to 10 seconds. At this point you can proceed to turning your console on and syncing the controller. With your console booted up you should connect your controller to your console via the usb cable(Type A to type b mini plug). After you connect the controller simply press the PS button in the center of the controller and wait for the controller to show a single blinking light on the front. At this point you can unplug the controller and the controller should remain connected to the console via bluetooth connection. If the controller does not stay connected, press the PS button again and the controller should connect as indicated by 1 light on the front of the controller being lit up and not blinking. 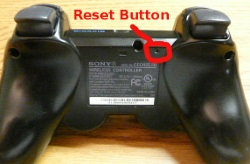 If controller still will not connect, proceed to reseting PS3 Controller. The first two lights on your controller coming on when you try to sync it via bluetooth generally indicates that the controller is a conterfeit. These controllers can not be used wirelessly. Return to Troubleshooting from PS3 Controller.